Michigan Avenue, once connected directly to the Outer Harbor via the South Michigan Avenue Bridge, was one of the main traffic arteries into downtown Buffalo from the Southtowns. Here, in a photograph taken by Wilbur H. Porterfield on April 5, 1953, is the view looking east from this lift bridge. On the left is the elevator and plant of General Mills, formerly (before 1928) the Washburn Crosby Company. In the center is the Michigan Avenue Bridge, which would be destroyed in the Tewksbury incident of 1959. 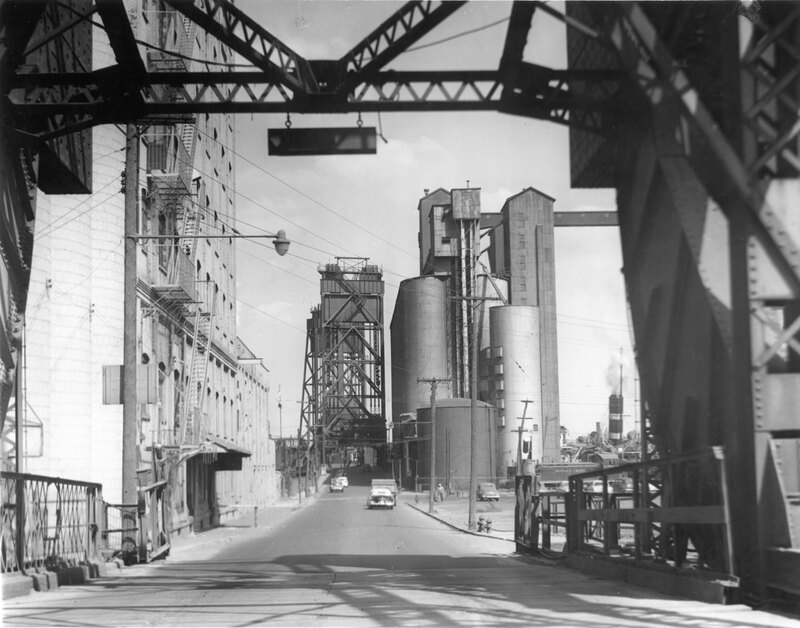 On the right is the Kellogg Elevator, built in 1910 as part of the Spencer Kellogg linseed oil factory. The City of Buffalo dismantled the South Michigan Avenue Bridge in 1964 and never built a replacement. Here’s the view now from where the foot of the bridge landed on Kelly Island.